Monitoring with Tinytag temperature and relative humidity data loggers is aiding the preservation and conservation of local authority archives. 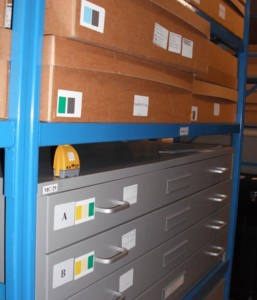 Tinytags provide environmental monitoring in local authority archives, recording temperature and humidity to help ensure the preservation of historic documents and artefacts. Recording conditions over time also helps ensure compliance with the requirements of the National Archives. The Medway Archives and Local Studies Centre is a local authority archive looking after diverse collections including petty sessions records, parish records, workhouse, business records and local authority archives spanning 800 years. The material stored is mainly paper and parchment but there are also some photographs and glass plates. Medway Archives is required to keep the collections at a steady temperature/humidity, and also required to show the National Archives that records of these conditions have been kept over a long period of time. Four Tinytag Ultra 2 temperature and relative humidity loggers are used to monitor conditions in the strong-room. Readings are checked every two weeks to spot any major fluctuations and identify what might be causing any variation. Alison Cable, the archivist for Medway Archives and Local Studies Centre comments, "The Tinytags are unobtrusive, portable and easy to use. The software is also easy to install and use. The loggers cost-effectively meet my current monitoring requirements, and the calibration service is quick and reliable."